I have had this card for quite a few years and have never had any problems using it for airfare and upgrades. Also I was told by a car rental place it has the 2nd best coverage only behind Amex Black. You have to use the card to purchase tickets or car rental in order to get the perks that may be the issue for some people. In theory, the benefits of this card seem great. In practice, I felt like I’m dealing with scam artists. Our overseas trip last year with United resulted in delayed flights, missed flights and luggage delays. When our luggage didn’t arrive and we had to attend a wedding and a baptism, I called the international number on the back of my Mileage Plus Explorer card. They informed me of the benefits that we have and the amounts that we will be reimbursed, indicating to save our receipts and save the delayed baggage claim. After returning to the U.S., I submitted the claim and the receipts. I repeatedly received notifications that I need to submit proof that I tried to collect money from the overseas airline partner (final destination) and that I was denied the claim. I was never told that this is a requirement when I called. After many failed attempts to contact the overseas airlines to get verification, I called the claims department by phone to discuss if I have any other options. The phone representative indicated that if I haven’t been successful in getting the information from the airlines, then I should send them proof of my attempts and the credit card claims department will work with the airlines to obtain it. Again, I followed the instructions that I received over the phone. A few weeks later, I receive another email indicating that the claim is on hold until I provide the requested information. I replied indicating that I am waiting on their help. Their response: Per your terms and conditions, "You are responsible for gathering the necessary documentation to complete your claim and that all documents including the claim form must be received as soon as reasonably possible." The claim can be reopened once you have filed that claim with the carrier and provide the documentation to substantiate your claim. There’s either a big disconnect between the claim officers and the customer support representatives on the phone or there’s a scam factor in the Explorer Card benefits. Very pathetic on their part, but the customer is the one suffering. 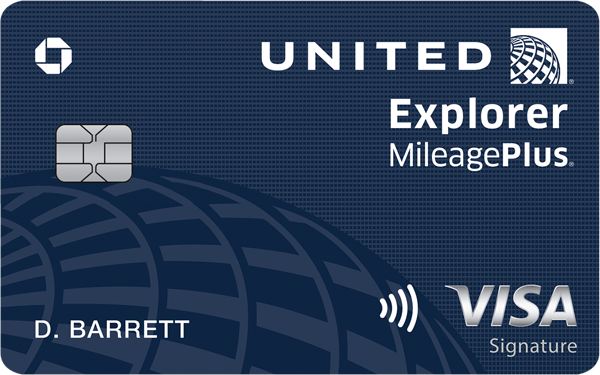 The Mileage Plus card has been my primary credit card for around 25 years until I received the Mileage Plus Explorer card a couple of years ago. As a result of this transaction, I cancelled the Mileage Plus card and soon to cancel my Explorer card once I determine how to use my remaining United miles before switching to another airline. I started reviewing online and I’m finding many cards offering similar benefits with no annual fees. Great rewards. Generous credit line. Approval at 684 TU 635-645 Fico. Didn’t pull EQ. They use some chase scoring model. Had 696 there. Card took full 7-10 business days so I’d expedite it. how many new accounts did you have within the last 24 months? Did you have any of your credit cards maxed out before applying ? Nice rewards. Generous credit lines. If you usually fly united this card is for you and pays for itself. I fly a few times a year with United, free baggage for me and one passanger and priority boarding, its worth the annual fee. Was offered 50,000 bonus miles for sign up, but after meeting all spending requirements was told I had signed up for an offer to waive the first year payment. Disputed, and was told there is nothing that can be done.